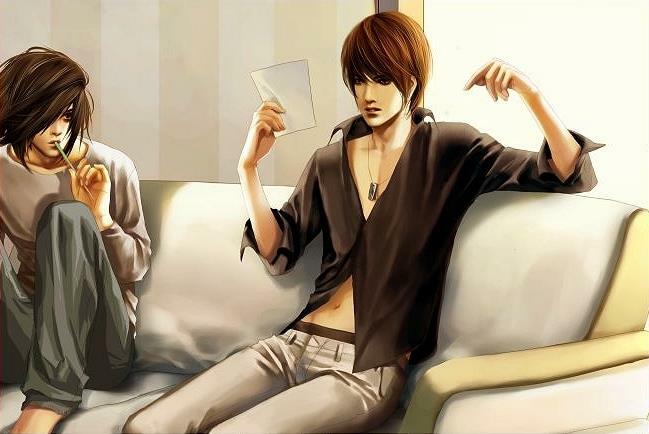 Light Yagami and l Lawliet. . Wallpaper and background images in the 死亡笔记 club tagged: photo death note death note manga character light yagami l lawliet ryuzaki detective kira. This 死亡笔记 photo might contain 裸露的双腿, 连裤袜, 紧身短裤, 紧身, 裸腿, 短裤, 短裙, 紧身的紧身裤, 吸引力, 感染力, 辣味, 热情, 上诉火辣, 精心打扮的人, 西装, 裤套装, 裤装, 穿着好衣服的人, 裤子套装, 穿得好的人, and 套装.